BBC NEWS | UK | Magazine | Why does the US need our money? Why does the US need our money? 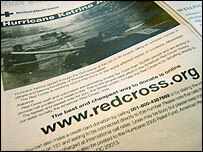 The Red Cross is appealing for people overseas to contribute money to its Hurricane Katrina Appeal. But why does the world's richest nation need handouts? The world's only superpower has been forced to turn to aid agencies to speed up the humanitarian effort in the wake of Katrina. Seemingly unable to draw on its wealth at short notice to immediately respond to the disaster, charities in other countries, such as the British Red Cross, are now launching appeals to raise money. In addition half a million military ration packs worth an estimated £3m have been flown out from the UK and more are expected to follow. The public in many countries are accustomed to providing aid to poverty stricken developing nations, but the need to provide assistance to the most opulent country in the world may leave many perplexed. It is not a position the US is used to being in either. President George W Bush seemed to initially dismiss suggestions of receiving foreign assistance. Later, US Secretary of State, Condoleezza Rice, said "no offers of assistance will be refused''. The gross national income of the US is $37,870 per capita, according to the World Bank. It is just $810 for tsunami-hit Indonesia and $200 for poverty-stricken Niger. And, national wealth aside, Americans have a strong track record of generosity concerning disasters on their own soil. They gave $2bn following the 11 September attacks. The British Red Cross says the appeal is about getting money quickly to speed up the aid effort, but admits it does raise questions about measures the US Government has in place to deal with large-scale domestic disasters. "We have been asked for help by our sister organisation in the US," says a spokesman. "This is the biggest humanitarian operation in its 125-year history, we are looking at an area the size of Great Britain that has been devastated. "But there are broader political questions about the response of the richest country in the world to such a disaster on its own soil. Hopefully they will be addressed in the fullness of time and lessons will be learned." No country has enough rations to deal with such an immediate need and so an appeal for outside help is inevitable, say experts. The Ministry of Defence's director of logistics operations, Brigadier Chris Steirn, who co-ordinates the distribution of all military supplies, says: "You don't have billions of rations stacked up in one place and so they are quite often traded between nations." But will the British public be as keen to make donations as they were after recent disasters, such as the Asian tsunami and famines in Niger and Sudan? Cathy Pharoah, a researcher at the Charities Aid Foundation, points out that it is difficult to predict how people will react because such devastation in such an affluent country is unprecedented in recent times. But she believes harrowing images depicting "human suffering" in the media will loosen British purse strings. "People wanted to see that the government of a highly developed western country were putting the money in, but when human need stories begin to emerge, people will respond." This may be the richest Country, but the poor exist here. If any light can be found from this tragedy, it is that the faces of the poor are being seen. The Country we live in has been concerned about bending over for business, in return the poor are lost. Those who will recover have the resources, those who won't, need the help. I will not be giving to this appeal. The United States is the richest country in the history of the modern world. They should be diverting their wealth into domestic social care programs not into imposing their economic will on the rest of the world. Maybe this will be the wake up call that the people of the US need. As a British citizen who has lived in the US for over 20 years and as someone who has witnessed the outpouring of help and aid, both financial and material, that this country has always given to those in need whereever they are. I am disgusted and appalled that reciprocal aid to us would even be questioned. Unless you are here in the US you cannot begin to comprehend the enormity of this disaster. The American public has already donated millions and millions of dollars as well as their time, their homes and their cities to the refugees. Of cause people gladley gave after the tsunami, that is understadable. But surely there are enough people in USA that can charitable donations. Should the US government not spend it's own money helping these people? Even if it ment selling gold reserves. To ask other nations for help, and then retaining wealth makes my skin crawl. What % of the American defense budget is needed for aid I ask? I can understand that aid agencies, such as the British Red Cross, can provide the physical help in terms of food parcels and staff on the ground. But why does this need to be paid for via charitable donations? Surely the US Government can transfer money to these agencies easily enough, rather than it needing to be raised by charitable donations. Your article raises a good question. Although the U.S. may be the wealthiest nation, we have been shown to be the least organized and least prepared. It is a shame and a sin that the aftermath of Katrina was so harshly felt by so many who were otherwise powerless in its wake. We are furious that our government has been so unresponsive to the needs of its citizens. Thank you to those around the world that helped, we needed it but shouldn't have. They don't need our aid. If they don't put their full backing to G8, how should they expect us to help? Although, we should help our 'across the pond' cousins need our help in this crisis. We would do the same...maybe they will give more generously next time. Jenny Bradbury, Canterbury, Kent, U.K. I think the immediate need is to help the poor people. 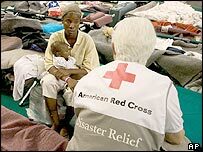 Donating to the Red Cross is helping the poor people. The median income in the US may be high, but the people in Louisiana, Mississippi and Alabama do not necessarily share in this wealth. Yes we should help. The area devastated is the size of the UK, no government could possibly help all of those people without aid, regardless of being a superpower or not! Your article makes it sound as if all of us are well off when in fact due to our cost of living a large portion of us are just getting by. We have a large number on assistance as well. Do not compare our supposed income with third world nations - due to the imbalance of the cost of living. You sound shocked that we need your (the world) help. When any other country has had a problem we have been there. Our resources are stretched a bit thin now, so we ask for your help. Think of it as a parent who has always been there for you and now needs your help to get by. Americans have been very generous in the past in time of need, even when we did not have much, we still gave. To not return the favor would be bad manners as well as the next time you need help we might be able to be there for you. We remember those who help us and those who do not. This is a disgrace. I am shocked by what happened to the people of New Orleans and surrounding area but To give to a country that obviously went to war for other motives and spent millions on this. A country that is the richest in the world and has the most resources. I will not be helping - Considering the country is reluctant to help the truly needy countries eradicate poverty. The US has shown amazing generosity in the past both in humanitarian and military help. It is really rather pathetic that some people seem to almost be rejocing at the fact the US needs help not withstanding the fact that any other country in the world would be far less capable of dealing with a disaster of this scale. We should remember the help offered by the US over the last century and dig deep now. I don't think this is an unreasonable request to make. As for "woulda" shoulda" coulda" - don't worry, we as Americans will be the first to question our country's slow response to this catastrophe. Some people are confusing International and Domestic Aid agencies with the US Government. The US Government has not asked for any help, while also stating that no offer will be refused. The Red Cross and Salvation Army are asking EVERYONE for donations so that they can provide immediate food and shelter to the people affected by this tragedy. Don't let your hatred of the current administration blind you to the plight of your fellow man. Seeing these comments I'm outraged at the reason people deciding not to give donations to this horrendous tragedy. When you deal with natural disasters politics should be set aside. The U.S. even sent aid to the victims of the earthquake in Iran in 2003. Venezuela and Cuba have offered help, and the U.S. are not in best terms with either country. LEAVE POLITICS ASIDE, AND HELP THESE VICTIMS!! Everyone always asks of the US for help. I find it amazing people find it a disgrace that the US are receiving aid. Surely, "treat people how you expect to be treated" still applies ? It's plain manners and humility. Thank you for your comments - this debate is now closed.